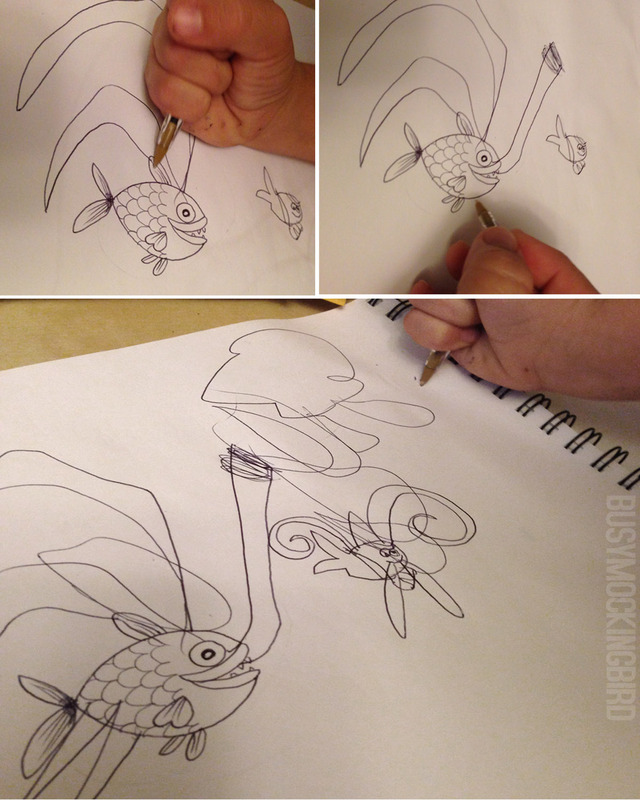 “Let’s both each draw a picture that’s a fish,” Myla said one day. We each drew our own on the same page, and, as will often happen, she inevitably became more interested in what was going on on MY side. So I make a joke out of it. “Oh yeah?!? You know what YOURS needs?? Lobster claws. Totally.” And then I reached over to her drawing and doodled a quick pair of claws. It cracked her up in a cascade of giggles. 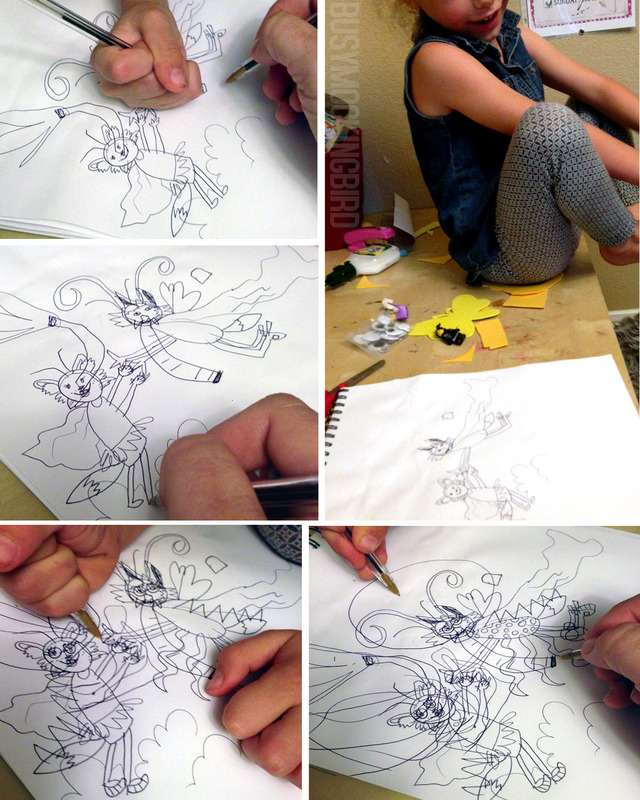 Pretty soon it evolved to an all-out doodle war. “Oh, yours would look SOOOO much better with walrus tusks!” “It’s good, but I think it could really use an elephant trunk,” we say to eachother in our mock-friendly voices. …And on and on. And since it’s just a quick little doodle, there’s nothing sacred in it, other than just having fun and being silly. I always love what comes of them, as crazy as they are. I’m wondering what a finer version of it might look like. maybe it’d be different than our usual collaborations. It might involve taking some time and patience, which is very difficult for a 5-year old. People have often tried to “tell” us what we should draw together, and while people sometimes have some great ideas, it sort of just has to happen. In my world, the things that I push the hardest on are the things that don’t ever feel as genuine, and therefore aren’t as enjoyable for the viewer or the ones creating it. 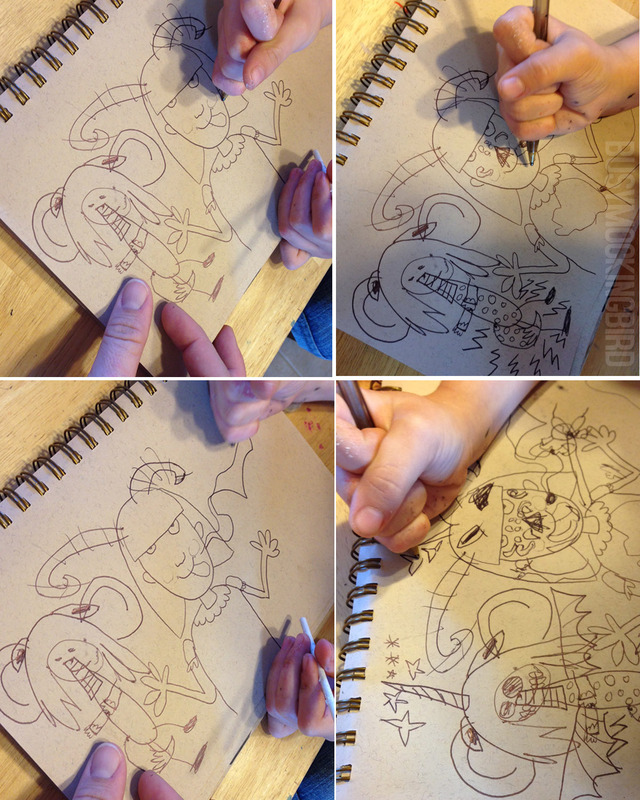 They can doodle way better than me. What a fun way to interact with you daughter! Such great memories you are making with her!! I remember doing line drawings with my dad when I was little – he’d start with a line then hand me the paper to continue the line. We’d go back and forth like this until we declared the picture was done. Oh, did we have some wonky looking pictures!! But it was great fun and a memory I cherish. Dad worked so hard when I was young, that he rarely had time to play with us kids, so it was precious when he made time to do something so silly and fun! Keep having fun with your daughter!